I guess I should start with a little disclaimer. I am NOT a vet – Have NEVER been a vet – and don’t proclaim to know as much as a vet. I don’t proclaim to be a bird psychologist either. I am not the be all, end all to bird wisdom. 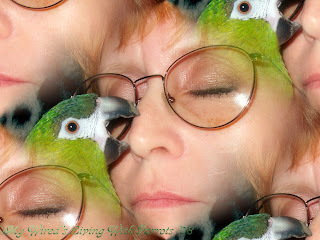 I’m just sharing my life with parrots – 12 large parrots, 27 smaller guys, spanning 13 different species, and 17 years. Half my flock have been hand-raised by me – the other half are rescues in one form or another. Everything I share concerning my birds, is not meant to be a prescription, or remedy, or solution, or method carved in stone. That being said, if some of my trials, triumphs, remedies, thoughts, heart aches, heart breaks, solutions, and/or humorous antidotes, prove to be useful, helpful, and/or entertaining to you, that’s good too. 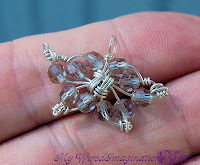 My very dear friend Corra gave me an advanced copy of her wonderful new holiday tutorial – SnowFlakes Wired Chinese Knot Earrings. I had ( along with many others), pestered her so much about it, she stayed up all night one night to do it. 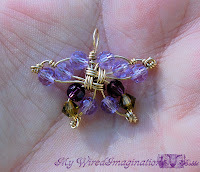 It is based on her Cubic Knot Earrings tutorial, which was great by itself, and these are even more fun. I went to town when I got it, and by accident, created my own variation….. After the first butterfly was born, I was thoroughly addicted. I’ve tried not to get carried away, but they keep evolving, and I love playing with different color combination’s. 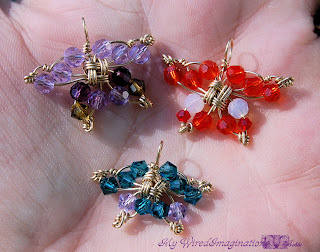 The purple one is my favorite (so far), and the blue one is on it’s way to Germany as a gift to a customer. 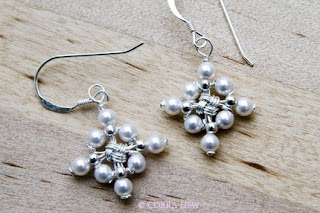 If you’re as fascinated by this design as I am, please visit Corra’s shop at Etsy, or her blog DecorsHandmades. 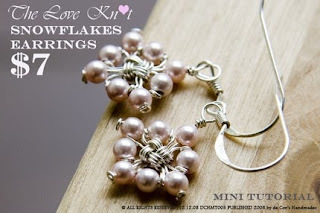 She has 9 delicious Wired Knots Tutorials, and 5 mini-tutorials available. Fall in love with all of them and she has 3 different tutorial packages to satisfy your need for knots. Thanks for stopping by – stop back again soon………………. Sooooo I had to bite the bullet, and get a new camera OUCH 🙁 and then re-do the images (and the tutorial pendant) several times to complete the tutorial. 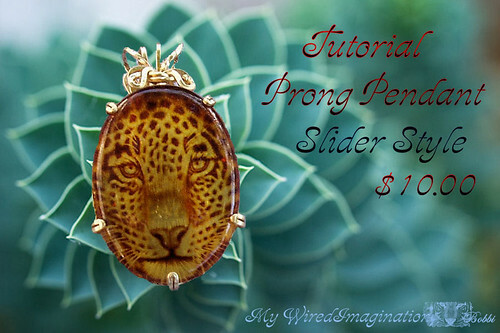 This tutorial teaches the techniques to wire wrap a slider style pendant, with a prong setting. It can be altered to set either a cab, or faceted stone. Modifying the gauge of wire and number of prongs, it can be used to set almost any size and shape of stone. You can find this and my other tutorials in my Etsy shop and on Craftsy. Thanks for taking a peek….